Winter in Philadelphia - We are months away from consistent spring warmth and miles from sunny groves of Florida oranges. 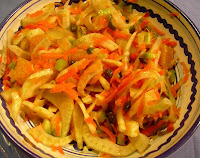 I think it's the ideal time to make a refreshing citrus salad to cure the winter and food blahs. This is not a new or original recipe, I've taken an idea from the January/February 2008 issue of Every Day Food and have enhanced and embellished a fantastic salad. It's the kind of side dish or salad course that can be adapted to suit your tastes and what you feel like purchasing at the market. The basics start with thinly sliced pieces of fresh fennel and orange segments. The vinaigrette is whisked together in a jiffy using some lemon and orange juice, the zest of the orange, salt, pepper and bit of olive oil. It holds well for a day or two, so if you make a big batch, you can bring some to work for your healthy lunch. It's also a great topping or side dish for a simple poached or grilled chicken, salmon or tilapia. Segments from 1 Large Orange - cut into small pieces- use the zested orange, then cut away the outer peel. Cut into the orange segments to remove from its membrane. Directions: Wash, peel and cut vegetables. Add all ingredients to a bowl or shallow dish and toss to combine. Dress with vinaigrette and serve immediately. Cover and refrigerate any left-overs and use within 2 days for best taste! Directions: Mix together the juices of lemon and orange, the orange zest, and the vinegar. Season with pinch of salt and pepper. Slowly whisk in the olive oil to emulsify. Pour over salad and serve. Unused vinaigrette's will hold for up to 1 week in a tightly covered container refrigerated.